It sounds like a scenario for a hilarious Hollywood summer hit: Take an army training centre run on disciplined military lines, throw in a bunch of animators, graphic designers and all-round art school types, and then see what happens. Comedy gold? In fact, what has happened is closer to a romance where everyone lives happily ever after. Through this unlikely alliance, the Army has found the skills it needs to train its soldiers using the most modern techniques, while recent graduates of New Brunswick Community College and other Maritime schools have acquired good internship opportunities that will help them hone their skills and make them more attractive to employers. And that’s not where the benefits end. 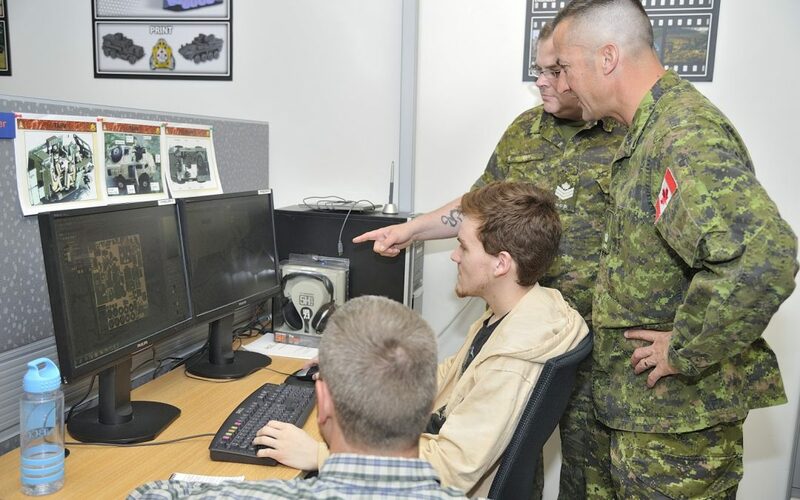 Located at the Combat Training Centre in Gagetown, as part of the Tactics School, the Army Learning Support Centre (ALSC) was created to help the Army modernize its training methods. Today, this includes everything from hyper-realistic computer simulations to purpose-built models turned out using three dimensional printers. Working from photographs and other media, the designers and modellers at the ALSC create highly accurate virtual models. It’s a painstaking business – they “build them polygon by polygon,” said the Centre’s director, Major Phillip Meaney. The complete works can be loaded into game engines and used for simulation on computer terminals or in larger simulators and then, if needed, turned into physical scale models to be printed using the Centre’s battery of 3D printers. It’s an ongoing process. “We added the TAPV (Tactical Armoured Patrol Vehicle) about a month or so ago, the crew stations and the model,” said Meaney. While the development of such esoteric content may seem an odd task for the Army, it makes senses financially. To pay a company to develop them “would be about $40,000; in terms of labour, we can do it for $5,000. And we own the intellectual property and can repurpose it,” he said. To help the military personnel and civilian employees who work at ALSC, the Centre has created an internship program in conjunction with New Brunswick Community College (NBCC) offering recent graduates from programs in graphic design, computer animation and other related disciplines the chance to spend a year working with the ALSC in Gagetown. The highly competitive program was the inspiration of the Centre’s previous director, Major Tom Batty, and has been in place in its current incarnation for three years. Would-be interns must be graduates of NBCC’s disciplines or another participating school and submit a portfolio. As well as working with the ALSC, students are enrolled in an academic component provided by NBCC. Students pay tuition, but are paid an hourly wage. On the day Canadian Army Today visited in late August, the latest batch of 30 interns was marking graduation as students prepared to wind up their year with the Centre. A few will return next year to serve as mentors to the incoming group of students. Of those moving on, a number already had jobs lined up in Montreal, Ottawa and Halifax. 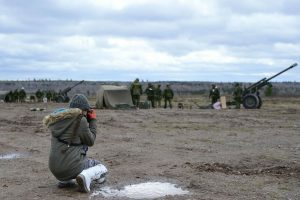 The paradoxical nature of the program – the military element combined with what could be called, perhaps, the artsy – was evident throughout the event. The graduation didn’t look too different from what you might see at a community college, with the exception of the large number of green uniforms scattered throughout the auditorium amidst the parents and friends there to watch the interns graduate. And the open house afterwards, where the students showed off their work, was pretty much what you might expect at a similar event in a more conventional graphic or digital arts program – if that is, you overlooked that Leopard tank interior on display on a desktop monitor or the small armoured vehicles parked in the streets of an accurate model of downtown Fredericton. An odd coupling that benefits all. For its part, New Brunswick Community College is looking to expand the program, by adding four additional mentor positions in the coming year. For them it’s a great way to prepare students for the workforce. “I truly think that these interns and mentors could go into so many industries,” said Josh Lamont, of New Brunswick Community College. The students themselves were uniformly enthusiastic about what they had learned: “I enjoyed it very much,” said Nishant Dhoketar, who hopes to work in movie special effects. Their enthusiasm for the military as a partner was also evident. “They have completely changed my perception of what [the Army is] like,” said Dylan McBurnie, a graduate of this year’s program who will be returning as a mentor.